Keep in mind that customers evaluate every single interaction they experience with your business. Brand consistency doesn’t start or end with visual explanations — it expands to the behavior of the people within your company. Therefore, your brand should be a representation of your company culture, as well as your vision. Take time to develop a proper brand which fits your style of being, and at the same time serves as a guide for consistent company behavior. You’ll recognize how your coworkers themselves build a connection to your brand. Educate them about the importance of brand consistency, and they’ll check themselves from time to time. In other words: make sure your brand sends the right message and stands by it. Once you’ve managed to set up a strong brand, it’s important to provide templates and guidelines to people using your brand. Give them something they can refer to when executing their work. 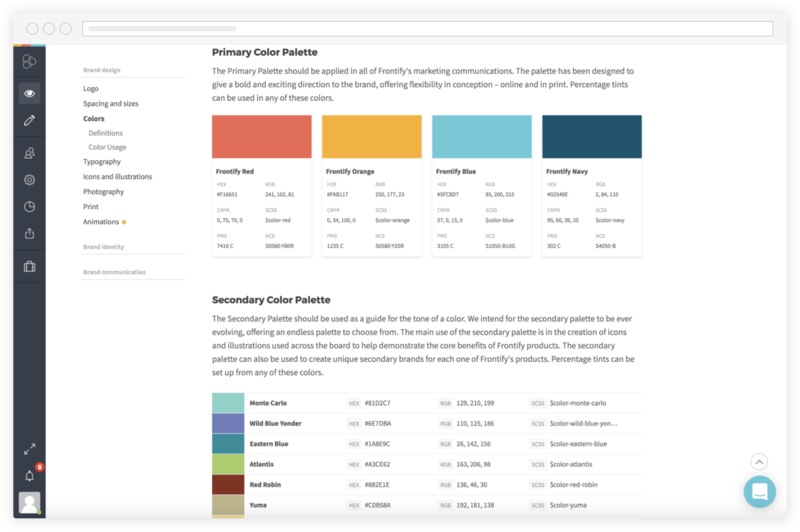 Create a Style Guide and include visual definitions like logo, spacing, sizes, fonts, icons, and colors. Remember that superficial categorizations (such as dark green and light green) aren’t sufficient to uphold brand consistency. Instead, describe your colors with, for example, hex code classifications. Again, keep in mind that digitalization brings along multiple channels to communicate your brand. One thing you don’t want to deal with is seeing the thousandth variation of your logo online. That’s right folks, we have technology. As good as your Style Guide might be, you cannot uphold brand consistency as long as your coworkers are unable to make use of it. Hence, share your Style Guide with the relevant people, and more importantly, share them online. Using a central online platform for your brand resources helps you saving time and provides you with more control. With a cloud solution, it’s neither necessary to work through a mountain of PDFs looking for guidelines about a logo, nor is it hard to find the newest version of it. To cut a long story short: the requirements to keep your brand consistent are accumulating. Keep in mind the three aspects mentioned above to successfully maneuver your brand through the digital age.